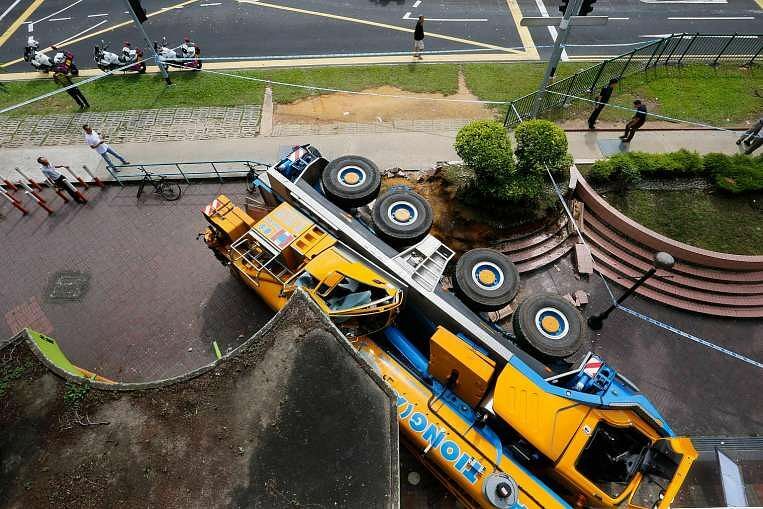 SINGAPORE - A 36-year-old Malaysian man has been arrested, after he crashed the mobile construction crane he was driving into a POSB branch in Woodlands on Wednesday (Feb 24) morning. The accident, which occurred at around 7am at 2A Woodlands Centre, drew scores of curious onlookers to the scene. A DBS spokesman, in response to queries from The Straits Times, said: "According to the police, the driver lost control of his vehicle while making a turn. He was also unhurt. "We are assessing the damage and our branch remains closed for now. Our staff have been assigned to help direct customers to other nearby DBS/POSB branches and self-service banking machines." Two Facebook users, Mr Steven Mekal and Mr Anthony Lim, had first uploaded photos of the crash, which showed a hole in the wall of the bank. A crowd of about 50 people were also seen gathering around the crane, which had apparently mounted the kerb. 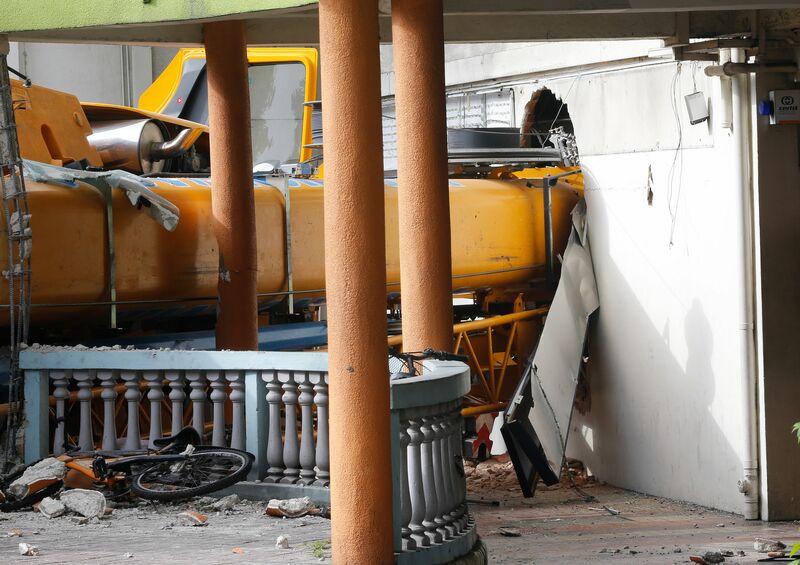 Chemical factory worker Yap Khoi Fat's motorcycle, which he had parked next to the bank before heading to the nearby food centre for breakfast, was dragged under the crane. "There were other motorcycles parked there too but only mine was dragged under the crane when it fell. It's completely flattened now and I probably can't get it back. I don't think I can have it repaired too," the 58-year-old Malaysian, who has worked in Singapore for the past 30 years, said in Mandarin. "I'm still in shock. I've called my company to tell them about the accident, but I don't know how I'll be able to get home today." As of noon, the crane had yet to be removed from the scene. The area also remained cordoned off by the police. The unusual sight continued to draw onlookers, mostly nearby residents, who took photos and chatted among themselves. Mr Samat Salleh, 50, said he was sleeping on the floor of his home, on the second storey of the block, when a loud crash woke him up. The security officer said he felt the building shake and thought it was an earthquake at first. "I went out of my house to check and saw the crane lying on the side of the block. I rushed downstairs and called the police. I also saw two guys help the driver out from the crane." Ms Eilin Soh, who was also woken up by the crash, reckoned that the driver had been attempting a left turn before his vehicle tipped over. "The road is quite narrow and the turn can be quite a sharp one. It would have been difficult for such a huge crane. This is also a busy road, with many heavy vehicles passing by every day because it is one of the main routes to Malaysia," added the 29-year-old, who is self-employed. The Singapore Civil Defence Force (SCDF) said it dispatched a fire engine and an ambulance but its assistance was not required. Engineers from the Building & Construction Authority (BCA) - as well as a professional engineer appointed by the building's owner - subsequently carried out an inspection and found that the crane had damaged part of a brick wall at the POSB branch and part of an adjoining linkway structure next to the building. The structural integrity of the building, however, was not affected, said a BCA spokesman. BCA has also directed the owner of the building to conduct a detailed investigation and recommend "permanent retification works".